Intersection at West Pt Loma and Bacon Street. 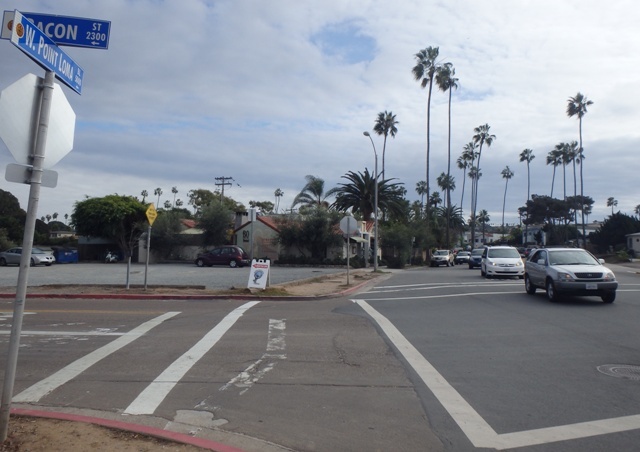 The OB Planning Board and City are considering the installation of a round-about or traffic circle at the busy intersection of West Pt Loma Blvd and Bacon Street in northwest Ocean Beach. Entrance – left – to Robb Field. Traffic gets backed up when sports events let out and during rush hours. City engineers have determined that a traffic circle would work at the intersection geometrically. So, the City is okay with the concept. There is a growing positive trend towards placing round abouts in urban areas impacted by traffic. The intersection in question gets quite busy during rush hours and when major sports events end at Robb Field and people depart the park. Traffic can get so backed up that the line goes all the way to Sunset Cliffs Boulevard. The intersection is just not your typical 4-way stop. There’s a separate lane for traffic to head east from Bacon Street – which used to have a “Yield” sign, but now has a Stop sign. And there is no sidewalk on part of the north side. Due to some confusion and the traffic congestion at the site, the Planning Board believes the city should study the feasibility of a round-about at the location. During the discussion, it was noted that there are a lot of nuances to designing traffic circles, and that drivers heading east on West Pt Loma who wish to turn into Robb Field may be confused by a traffic circle and instead of following the curve around, could turn left directly into Robb Field, inviting trouble for other vehicles coming around the circle. The Planning Board on November 5th voted 12 to 0 to direct the city to look into the feasibility of installing a round about at the intersection. 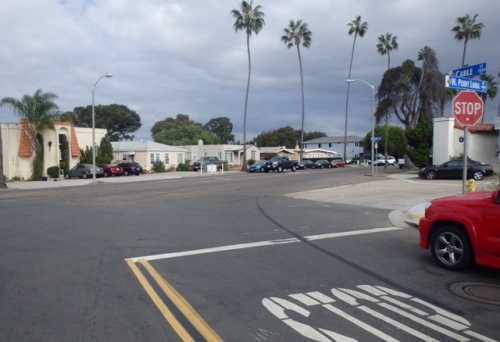 Another intersection that can be difficult: West Pt Loma and Cable Street. Other intersections were not discussed during the debate on this one. 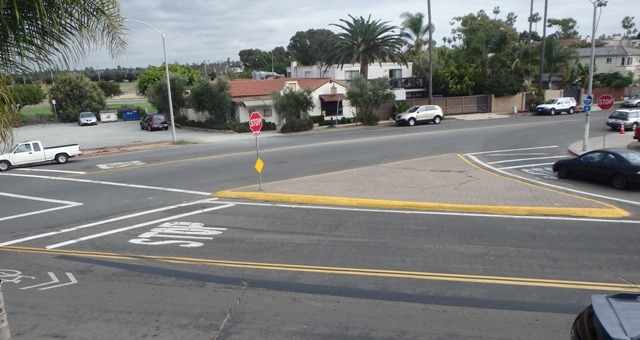 To a non-partial observer, there may be other intersections where West Pt Loma Boulevard meets the north-south streets where other traffic circles also could be installed. For instance, traffic can get backed up at West Pt Loma and Cable Street. Round-abouts are a good idea but they should also be utilized as rain gardens (Google it) where they clean rain water runoff 30% to 4o% before going into the sewer system. Actually we should have a separate storm water system from the sewer system for all runoff from public and private property that cleans it through a natural system then could be released back into are waterways. Also private properties could contain runoff on their properties and recycle it as grey water. Did they talk about removing that separated right turn you mention (going onto West Point Loma east-bound) in conjunction with this? Would seem to make sense to have all traffic routed to a straight intersection and establish sidewalks on all sides. I say go for it on the feasibility study, but am suspect on a roundabout working in this location. It’s not a neat perpendicular intersection with right angles, which detracts from visibility and makes it a little more confusing for people IMO. Additionally, a lot of the incoming afternoon backup that happens going northwest-bound on West Point Loma would likely just get moved to the southbound stop sign at Bacon and Voltaire, and potentially back up into the roundabout itself. That would be a huge problem as far as I can tell. I posted this in another thread about the intersection so I’ll just copy and paste. I live on West Point loma between cable and bacon and the intersection at bacon is never an issue. The confusing intersection (for non-locals) is West Point loma and cable. It’s not only confusing for some, it’s dangerous as hell. I avoid the intersection at all costs especially when I’m on my bike. I’m not a big fan of additional ltraffic lights but installing one at West Point loma and cable would not only ease any last minute lane confusion but it would also slow the speed of traffic down which I think is the most important. I would rather have congestion than danger. People are constantly speeding on West Point loma down to the stop sign at bacon. Just recently a locals dog was killed by a speeding hit and run driver.